RNK's newest embroidery product lends a helping hand while stitching challenging items! Embroidering and embellishing small or tubular items such as a baby one-piece, a t-shirt, a sock, a hand-bag or similar pieces require us to really manipulate the item in order to get it in the hoop and under our needle successfully. RNK's new Embroidery Perfection Tape is the absolute quickest and most simple solution to these challenges. 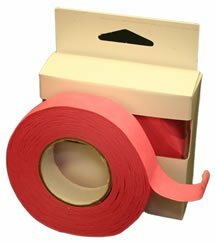 The tape will hold back most fabrics without leaving a residue on the hoop, machine or fabric! Use for quilt in the hoop designs, holding stabilizer in place, keeping fabric or embellishment pieces from folding over and getting caught under the needle, etc. RNK's Embroidery Perfection Tape is a must for all who embroider!